The chart to your right, is one reason why at WT Wealth Management we much prefer a "steady-as-she-goes" path to investment returns. 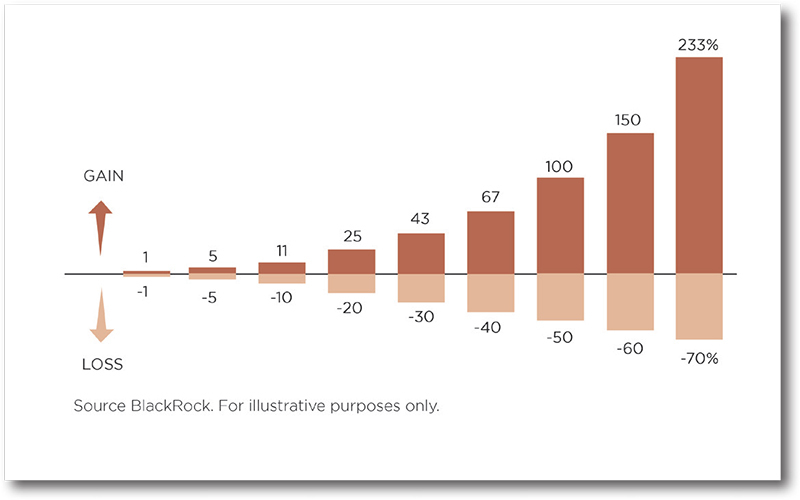 This chart illustrates that a 10% loss in your portfolio, while may be uncomfortable to endure, it only takes a 11% gain to recover from that 10% drawdown. In many cases, based on past recoveries, that could be done in 6-12 months or even as few as several months. In late 2015 and early 2016 we witnessed just that. From November 2, 2015 to February 8, 2016 the S&P 500 declined just over 11% and by May 23rd we had recaptured that entire loss. By early July we had set an new all-time on the S&P 500. From that low pint in February of 2016 we have added on nearly 30% to the S&P 500 as of May 5, 2017. On the other hand, a 30% loss requires a 43% gain which obviously would take a substantially longer duration to recover from. While our approach might mean giving up some blockbuster numbers during equity market booms, it can also mean a potentially less treacherous fall on downturns. In the long run, that patient, steady (and studied) approach can be more successful for our clients. Drawdown protection is a particularly important dynamic when markets are volatile, which is what we expect for the remainder of this year. A portfolio built with some "buffers" is better equipped to weather those drawdowns and deliver superior results over full-market cycles, which typically take 5-7 years to be fully realized. According to a recent study by Isaac Braley, president of BTS Asset Management of Lexington, Mass., 75 percent of a group of surveyed advisors emphasized capital preservation as a primary concern among investor clients. In addition, 45 percent said clients were mainly concerned about losses on equity investments, and 30 percent said clients were worried that their investments would not yield them sufficient returns to last them the rest of their lives. Furthermore, 99 percent said clients tended to buy an exchange-traded fund (ETF) based on its track record rather than its brand name. If we had the opportunity to do so, we would challenge other advisors on their stated criteria for purchasing ETFs. We commit to looking at industry asset flows every week, and we always find most fund flows channeling into the most prominent fund names, who are not necessarily the highest performers. Clearly the advisors in that survey want fund managers to reprise the actions they took in other strategies that apparently account for the success of those big brand names. At WT Wealth Management, we believe those advisors are mistaking brand for track record. As a researchdriven firm, we do not care about names. For we can best serve you, our clients, by not even looking at the names of the firms that sponsor our investment products. We crunch the numbers alone, and from only those numbers we determine where we believe the best upside participation may be coming from while protecting our downside participation. How do we accomplish that? For years we have observed that a key statistic in selecting an investment is upside/ downside capture ratio, which measures the degree to which a fund has underperformed or outperformed a market benchmark based on monthly returns during periods of market highs and lows. If a fund's increase parallels that of the benchmark, the fund's upside capture is 100 percent. If the upside capture is 120 percent, then the fund rose 20 percent above the benchmark. An 80 percent ratio means the fund captured only 80 percent of the positive returns the benchmark enjoyed. Downside capture, however, compares the returns of a fund to the proper benchmark's negative returns in a particular fiscal period. A 2 percent decrease in a fund's returns while the benchmark has lowered 2 percent yields a 100 percent downside capture. 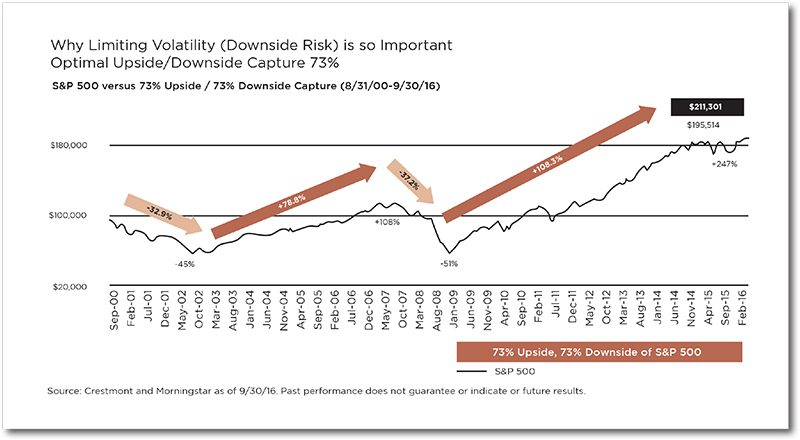 If the downside capture were 80 percent, then the fund would fall 8 percent were the market to drop 10 percent. 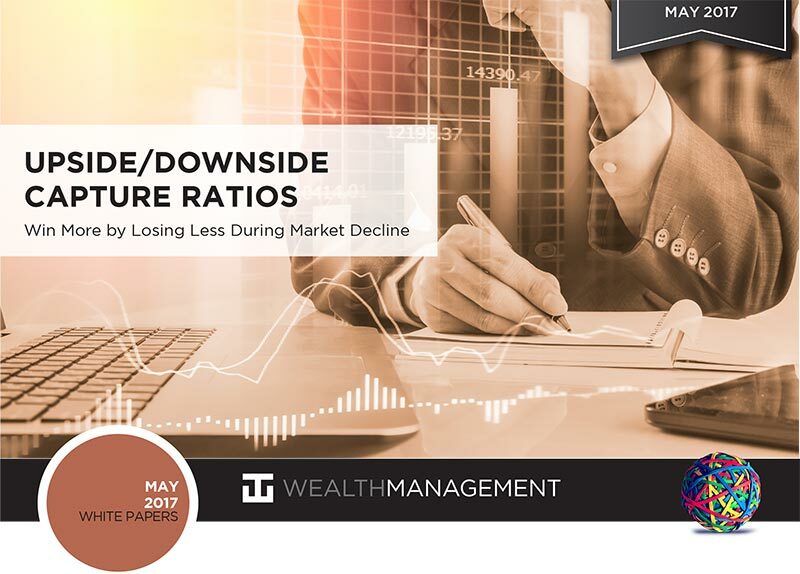 A 120 percent downside capture denotes that a 10 percent benchmark decline would give the fund a 12 percent loss, or a 20 percent greater loss than that of the benchmark. When we head out on the road, we learn more and more about our client's misconceptions. We take considerable time to explain to clients what it means for us at WT Wealth Management to take a measured approach to investing and to implement strategies to protect principal but still grow capital. We love it when lightbulbs go off and clients see our proven, measured approach to long-term wealth accumulation. At WT Wealth Management, we had always believed that this approach was the best way to grow account values by limiting drawdowns. Then something exciting happened. This past February we attended the TD Ameritrade conference in San Diego and participated in a session with BlackRock Investments, the world's largest asset manager with $5.1 trillion —yes, that's trillion—under management. A leader in creating low-volatility ETFs, BlackRock recently completed a study examining upside/downside capture ratios. They found that, since 2000, if you captured only 73% of every upside move and participated in 73% of every downside move, then you would have outperformed the S&P 500, and that 73/73 was the ultimate, perfect sweet-spot after looking at every combination from 1/1 to 100/100. To us at WT Wealth Management, this reconfirmed that we had been on the right path for the past several years. It was an exciting turn of events for us. Upside/downside capture ratio, in our opinion, is the most important but most overlooked statistic in mutual fund or ETF selection, for building a strong foundation and a stable base is fundamental to what we do. At WT Wealth Management, we screen hundreds of ETFs to identify those with exceptional upside/downside capture ratios, exposure to sectors and industries we find most attractive, and low internal expenses. Every investor—large or small, aggressive or conservative, old or young—starts with these exceptional ETFs as a base, and then we branch outward to personalize your portfolio and deliver returns in accordance with your personal risk profile, time horizon and investment objectives. When I show clients an ETF that has captured 110% or 120% of the upside and 65% or 70% of the downside of each S&P 500 move over the last three years, they think I have found the "holy grail." The truth is, I have—but only for a fleeting moment. I've seen the trailing one-year capture ratios flip-flop from super-good (150/50) to super-bad (50/150) in only three or four months. Nothing lasts forever, and the markets will become growthbiased, value-biased, momentum-biased, or defensive-biased in just a few short weeks. An ETF that seemed like easy pickings one year will be a thorny bush the next year. So the moral of the story is: Don't expect every dollar of every upside move—but don't worry, you won't get every dollar of every downside move either. As the BlackRock study showed, if we can deliver a total capture ration on your portfolio in the 75% range, then we can outperform the S&P 500. The truth of the matter is, our expectations are higher, and we strive to obtain 80-85% of every upside move and 60-65% of every downside move, thus to generate return that surpasses even the 73/73 that Blackrock determined to have been the upside/downside sweet-spot since 2000. WIN MORE BY LOSING LESS. WT Wealth Management is a registered investment adviser in Arizona, California, Nevada, New York and Washington with offices in Scottsdale, AZ Jackson, WY and Las Vegas, NV. WT Wealth Management may only transact business in those states in which it is registered, or qualifies for an exemption or exclusion from registration requirements. Individualized responses to persons that involve either the effecting of transaction in securities, or the rendering of personalized investment advice for compensation, will not be made without registration or exemption. WT Wealth Managements web site is limited to the dissemination of general information pertaining to its advisory services, together with access to additional investment-related information, publications, and links. Accordingly, the publication of WT Wealth Management web site on the Internet should not be construed by any consumer and/or prospective client as WT Wealth Management solicitation to effect, or attempt to effect transactions in securities, or the rendering of personalized investment advice for compensation, over the Internet. Any subsequent, direct communication by WT Wealth Management with a prospective client shall be conducted by a representative that is either registered or qualifies for an exemption or exclusion from registration in the state where the prospective client resides. For information pertaining to the registration status of WT Wealth Management, please contact the state securities regulators for those states in which WT Wealth Management maintains a registration filing. A copy of WT Wealth Management's current written disclosure statement discussing WT Wealth Management's business operations, services, and fees is available at the SEC's investment adviser public information website – www.adviserinfo.sec.gov or from WT Wealth Management upon written request. WT Wealth Management does not make any representations or warranties as to the accuracy, timeliness, suitability, completeness, or relevance of any information prepared by any unaffiliated third party, whether linked to WT Wealth Management's web site or incorporated herein, and takes no responsibility therefor. All such information is provided solely for convenience purposes only and all users thereof should be guided accordingly.